This is a good example of resurrected failed experiment! I was trying to use up some egg whites the other day by making meringues. I thought to be somewhat healthier I would try to make it with coconut palm sugar, however as I was adding the palm sugar to the stiff egg whites, it ‘flopped’ in the bowl and I knew it just wasn’t going to rise. I put the mixture into a silicone tart shell and baked it the same as the meringues just to see what would happen. It didn’t rise, in fact as it cooked it flattened even more and browned quite a lot. When I took it out of the pan and ripped a bit off to taste, it tasted so caramelly. The rest of the family had a taste and as one of my boys said, ‘it’s a failure that’s a success’! 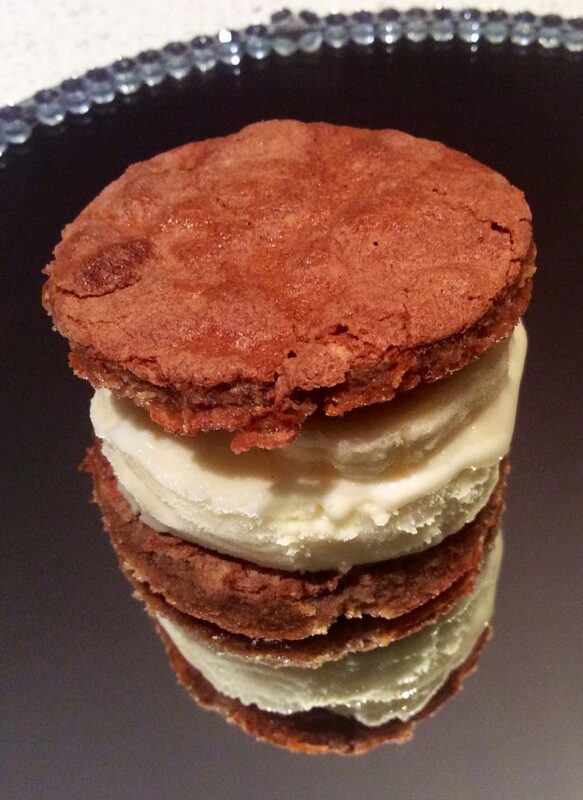 So with a scone cutter, some ice-cream and a few slices of banana, the ice-cream sandwich was made! Whisk egg whites until stiff peaks. Gradually add palm sugar until sugar is dissolved. Stir in vanilla, vinegar and cornflour. Bake in oven 160C for 25 mins then 150C for a further 25 mins then turn oven off and cool in the oven. Remove the meringue ‘disc’. Use a round cookie cutter to cut shapes, scoop ice cream onto a round and top with a second round. I added a few sliced of fresh banana but you could also add chocolate sauce or nothing at all!